Welcome to CompareCRM.com! The only site on the web that will help you find the BEST CRM for your business. Comparing software vendors will help ensure that you find the vendor who offers the right CRM Software that will help your business grow. Whether you're just beginning your hunt for new CRM Systems, if your company is evaluating their existing Customer Relationship Management, or if you already know which CRM Software modules will help your business run smoothly, we can help! In an effort to simplify the process of finding the best CRM, we've compiled a list of CRM Software Reviews to help your company find the right software that fits all of your business needs. The goal of CompareCRM.com is to help companies find the CRM provider with the right CRM Systems that will optimize their businesses with a more efficient salesforce, shortened sales cycles, and improved customer service. 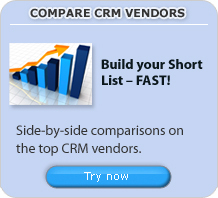 The only way that a company can find the best CRM is to conduct a CRM Software comparison. Companies need to look beyond the price tag of CRM Software and focus on the features they need such as sales force automation, marketing automation, and customer service. We provide you with the information needed to compare CRM Software to ensure that you make the right purchasing decision. CompareCRM.com provides CRM Reviews which take an in-depth look into the details of various CRM systems including Salesforce.com, SugarCRM, and Microsoft Dynamics CRM. Reviews include detailed information on products and even inform you if they are Web based CRM or On-Premise CRM. CompareCRM.com also regularly updates and publishes informative CRM Software Articles that covers everything from the differences between Small Business CRM and Enterprise CRM, to more advanced articles that take an in depth look at various front office practices that have helped companies grow and streamline their business processes. Another great resource we offer is our 2011 Top CRM Software Vendor Reports which can be downloaded for free on our website. These immensely popular industry reports feature important information on the leading CRM Software companies. Make sure to regularly check our site as we are continually adding more CRM Software Reviews, CRM Software articles, CRM Software blog posts, and CRM Software news. And remember to download your free copy of the 2012 Top 40 CRM Software Vendors report. 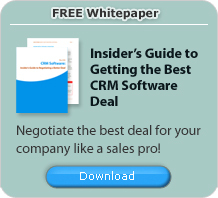 CRM software can benefit a company�s salesforce in 5 key ways. Although it sometimes takes the company�s salesforce to come around to the idea of using CRM software, CRM software can help improve the efficiency of a salesforce. Customer Relationship Management or CRM software, is a software solution that is designed to help companies improve the way businesses connect with their customers. Customer Relationship Management software along with improving customer service and also increase a company�s profits. While many companies are realizing that CRM solutions are important to improving their customer services and helping to retain current customers, some companies implementing CRM solutions ultimately fail at implementation and never reap the benefits of a CRM solution. 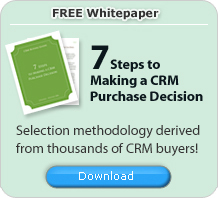 There are many reasons why a company should start using a CRM system. The results of successfully implementing a CRM system can lead to increased customer satisfaction and increased profits. Every company needs to know the basics of CRM systems before they start the researching process. Companies are realizing the benefits of CRM software every day. While CRM solutions are made to help streamline business processes and make life easier, there are some steps that if not properly thought out can cause a CRM solution to fail. When researching Customer Relationship Management Software, there are a lot of acronyms that can make CRM researchers feel overwhelmed. The CRM Glossary is a list of common CRM definitions that will more than likely come up as you research CRM systems.